Its been a while since I’ve written about Landon and Kate’s progress on the house, so I thought I’d give you all an update. Once we got the main living areas painted, it was onto much needed storage for the bathroom. Landon hung a wall cabinet and changed out the light fixture in there. 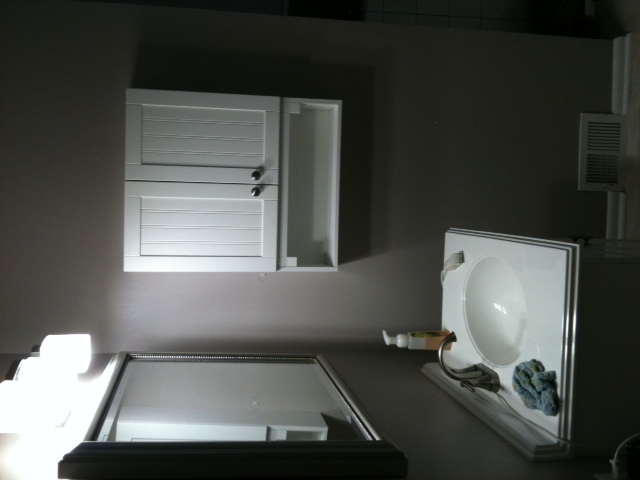 New storage and lighting in the bathroom. They are still on the prowl for kitchen furniture, but have bought a great looking sleeper for the basement to accommodate wedding guests this summer. The master bedroom is getting our attention now, and if you read my previous post about our plans, you’ll know that the walls will be covered in grasscloth, the wall of closets disguised by linen curtain panels, and that we’ll get new bedding and hang sconces to flank the bed. We’re getting close to installing these changes: Landon purchased the curtains, and has place a second order for the wallpaper, since the first order was just too light in color. Once it arrives, I’ll help him hang it, and get the curtains up to mask the closets. Now ew just need to settle on the sconces. For the bedding, I think waiting until the paper is hung would be best, to get a feel for what sort of color and print would complement the heavy texture. In the spirit of easy and quick changes, Landon and Kate have decided to go with the plug-in variety rather than make holes in the walls and hard wiring. There are lots of great looking wall lamps available, but we do have some specific wants: adjustability for ease of reading in bed, something with a finish that will contrast just enough from the grass cloth, and a transitional style to fit with the restful look we are going for. Here are a few affordable, but great options. 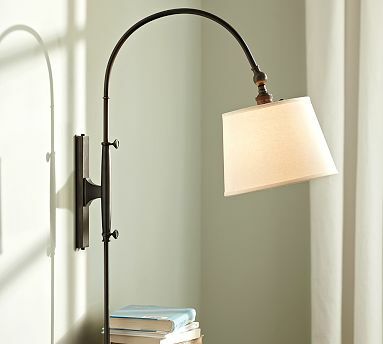 Crate & Barrell's Metro Swing Arm sconce. I little modern, but I like the crispness of it. Feels very hotel-y. Would be a nice foil to the natural element of the grasscloth. Pottery Barn's Chelsea Swing Arm is on the traditional side, but would work very well with the other elements in the room. It's classic, but doesn't really make any design statement. 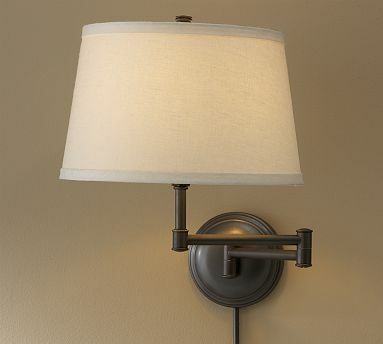 Also from Pottery Barn, the Arc Sconce. 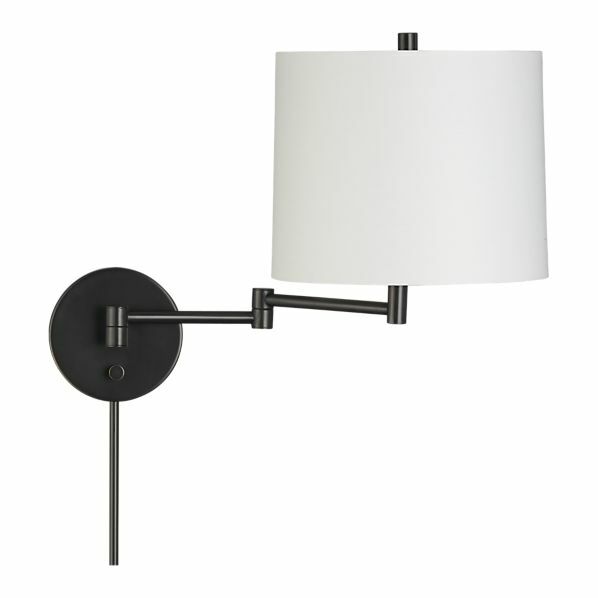 I really love the graceful line of this adjustable sconce. I think it's classy, and a little unexpected. 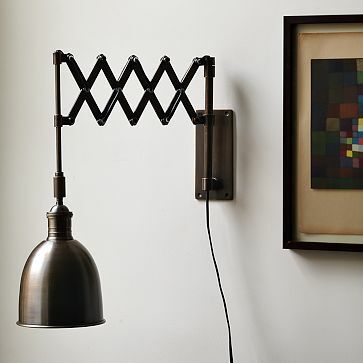 The Accordion Sconce from West Elm has an industrial and rustic vibe. I think these would look incredible and very cozy by the bedside. Of all of those great pieces, I think the Arc Sconce is my favorite. It seems both unique and practical. Of course the sweet couple may find something entirely different, as they are extremely resourceful. I’ll update you when they make a decision. Love, love, love all of those sconces! Good finds. Thanks! Can’t wait till all is said and done, and I can snap a photo of them hanging in place!